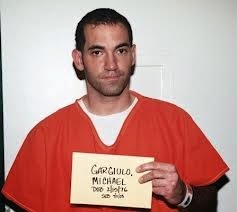 Michael Thomas Gargiulo, in custody, 2008. UPDATE 5/9 10:30 AM clarity, accuracy. I'm on the 9th floor. Defense investigator Chris Nicely is here. He's wearing a deep green corduroy jacket that looks nice on him. I'm trying to charge my phone from my laptop since it's almost dead and I forgot to bring a wall wart for my phone. Earlier, while I was walking to the courthouse from the train station, a voice to my left said hello. It was DDA Garrett Dameron, co-prosecutor on the Gargiulo case. When I arrived, there were already a few jurors from Dept. 107 sitting on the bench at the very end of the hallway. They are waiting for the show to get on the road in the jury site visit. A few moments ago, Judge Lomeli comes out of Dept. 107 and unlocks the front door. He's wearing jeans and a dark brown leather jacket. He's casual, but sharp. He says hello to the jurors who are sitting on the end bench. DDA Hum arrives with Detective Leslie on the 9th floor. They go directly into Dept. 107. DDA Hum is wearing a suit and Detective Leslie is more casual. We exchange quick waves as they pass. Detective Mark Lillienfeld arrives on the 9th floor. He doesn't see me. He's intently engaged with his cell phone. Defense attorney Charles Lindner arrives with his son, Abe, who is also his paralegal. If I remember correctly, Abe is in law school. Lindner makes a comment that I infer is directed at me but I totally miss his meaning. I have to tell him that I'm sorry I didn't understand. I believe Mr. Lindner then clarifies "James Boswell." I apologize that I'm not the learned scholar he is. I did not get his reference. Lindner explains that Boswell was a famous biographer of a contemporary. I reply that I'm not any of those things. I step inside Dept. 108. It's already quite busy with several counsel in the well and as well as counsel in the gallery and general public in the gallery. There are notebooks on the seats in the jury box so that tells me that Judge Ohta is in trial. As I sit and wait for a bit, it's clear that Judge Ohta has at least one other, possibly two pretrial hearings this morning besides Gargiulo's hearing. Several of the gentlemen in the well I've seen before in the hallway or in other pretrial hearings. It's quite busy. Counsel are coming and going from the well and the gallery. As I wait, defense attorney Mark Werksman arrives and whispers to two gentlemen sitting in the gallery. They step outside to chat. Werksman recently went into partnership with former DDA Alan Jackson. Back in 2011 I covered the James Fayed Trial. Mr. Werksman was Fayed's attorney that represented him during the guilt phase. I have to say that Mr. Werksman was very kind and friendly to me when I covered that trial. There are two bailiffs in Judge Ohta's court today. I don't recognize either one, and I'm not sure which one is Dept. 108's bailiff, but it may be the shorter bailiff with the black hair. In addition, there is a new court reporter with blond hair. Jane Robison, with the DA's office is in the gallery as well. A defendant is brought out. He will be making a plea agreement. It appears to be a mortgage fraud case with multiple defendants. This defendant is charged with 26 counts. The defendant will take a plea today but there is a request to the court to hold off sentencing until December 10. From what I think I'm hearing, the prosecution and defense need to work out a restitution amount, possibly a 1 million restitution settlement. Two women arrive, one with a young child, possibly two or three years old. They all sit in the front row. Judge Ohta is looking over the specific counts, and where the defendant will admit to the allegations on each one. From what I'm hearing, it appears the court wants to be sure that, where the defendant will plead to a specific charge over $500,000.00, that charge is in fact, over that amount. Judge Ohta goes over the plea agreement and makes notes on his copy. DDA Daniel Akemon, and DDA Garrett Dameron arrive. They step outside with Detective Lillienfeld to chat privately. Judge Ohta calls the current case and the defendant is brought out. The case is a multi-defendant case. Several defendants have already negotiated plea deals. The plea agreement for this defendant is signed April 15th, 2015. The 26 counts are read. There is a special agent [FBI?] from the [federal? state?] government who is at the prosecution table today. 1 count, conspiracy to commit grand theft. 1 count conspiracy to commit mortgage fraud. 16 counts [proctoring?] or offering false instruments. There are also three special allegations, and the defendant will be required to admit to those, too. Allegation to take property worth over 1.3 million. White collar criminal enhancements ... [where?] two or more felonies are related. The defendant is being offered six years in state prison. Victim restitution has not yet been determined. Judge Ohta then addresses the defendant on his rights that he is giving up and if he understands everything about the plea agreement. JO: You will be on the hook for paying restitution. Do you understand that? JO: Do you wish to go through with this? There are three other defendants that will remain as trial defendants. JO: [The] maximum sentence is 24 years, 3 months [if the defendant was sentenced to the full amount he could receive]. Do you understand the potential sentence? Judge Ohta tells the defendant that before he can accept his plea he must ask him a series of questions. Judge Ohta asks the defendant about each and every right he has, and if he gives up that right. Judge Ohta also explains what he might be facing if he violates parole. The counts are read and the defendant pleads guilty to all the counts. Afterwards, the defense attorney asks the court a question. "The defendant's wife asks if the court will permit her to give her husband a hug." Judge Ohta replies, "I understand, but I won't permit that." Next up are two separate cases of defendant's not filing tax returns. These next two defendants are Mr. Werksman's clients. The first defendant, his charges were reduced to a single charge and I believe, reduced to a misdemeanor. I stepped back outside into the hallway. DDA Dameron, DDA Akemon Detective Lillienfeld and Mr. Lindner are having a discussion. When I step outside, DDA Dameron asks me if they are still going. I tell him they are. When I approached DDA Dameron, Mr. Lindner makes it clear to me that they are having a private conversation and he doesn't want me to overhear anything. I walk down towards the center of the hall to give them plenty of privacy. After a few minutes of stretching my legs, I head back into Dept. 108. I'm right behind Mr. Lindner in his wheelchair, helped by his son Abe, but there are a group of attorneys in the ante-chamber having a discussion, so it was a bit cramped. I wait for Mr. Lindner to get through the second set of doors, first. I take a seat in the back row in one of the red padded chairs against the back wall. Mr. Lindner is to my left, chatting with a man who is seated in the last bench row of the gallery. When he backs up his wheelchair, I don't think he realizes that he's about to bump into me. I gently put my hand on Lindner's left shoulder and say, "Mr. Lindner, I don't think you know, but I'm behind you." Mr. Werksman is now before the court with his other client. The second defendant, I don't believe was as lucky as the first. He was charged with a felony and I think that felony stands. All while these hearings were going on, there were counsel coming and going at the clerks desk, and people coming and going from the gallery. "[I] Went to elementary school with Ms. Michita [sp?]. Her brother was a friend of mine." I believe the court also adds that the woman DDA has a photo of him together with her brother. Then Mr. Lindner gives the court a story from his own life experience. The Gargiulo case will be next. We wait for Gargiulo to be brought out. There is a bit of shuffling of counsel in the well. While this is going, Judge Ohta I believe addresses a comment to DDA Akemon. The court states, "Lots of shake up at the top of your food chain." I'm not certain, but I think DDA Akemon may have given a quick response, like, yes. DDA Akemon and DDA Garrett moved away from the conversation and did not engage Judge Ohta in the topic. I think Mr. Lindner misses the reference and Judge Ohta says something to the effect, "You don't know about the lawsuit?" Lindner then catches up and realizes they are talking about the lawsuit that DDA Beth Silverman and DDA Tannaz Mokayef filed recently. Before counsel go on the record, I hear a date of June 12 being tossed around. I'm relieved. I was crossing my fingers that nothing would be scheduled on June 11, because that's the date set for oral arguments for Stephanie Lazarus' criminal appeal for her March 2012 conviction on first degree murder in the death of Sherri Rae Rasmusssen. While counsel and the court wait for Gargiulo, Judge Ohta brings up sports to chat about. Judge Ohta asks counsel who they think is going to win, the Clippers or Golden State. The attorneys for the case in trial have also arrived and are trying to find spots in the well for their files and carts. Judge Ohta tells counsel that he thought Kentucky would win the whole thing but Kentucky lost. There's more sports chatter. One of the bailiffs gets in on the conversation. At some point before Gargiulo is brought out, Judge Ohta informs his court reporter that the next case is a death penalty case. Gargiulo is brought out. He looks much the same as the last time I saw him. He's in the orange jumpsuit. He's completely bald and clean shaven. He's carrying a folder with some papers inside. Gargiulo sits at the very end. There are extra seats at the table for the case in trial. Lindner is several seats away from Gargiulo. His paralegal, Abe, is to Lindner's right and closer to Gargiulo. They both lean over as best they can to speak to him. Judge Ohta goes on the record. He asks counsel to state their appearances. Today, on behalf of Gargiulo, Mr. Lindner filed a 995 motion to dismiss. Judge Ohta states it's a 131 page document. Counsel recommends a come back date of June 12 for the prosecution to file their response motion to the defense 995 motion. The defendant just told [counsel?] he would like to make a Marsden motion this morning. Judge Ohta informs Gargiulo that he is currently in trial. He does not have time to do the motion today. Judge Ohta also indicates that the defendant has a general time waiver, so there is no need at this point, to set calendar. June 12 is set for return for further pretrial. Counsel, the court and Gargiulo set a date to come back for the Marsden hearing. I miss who offers the dates of the 13th or 14th of next week. Both sides don't have a preference. Both dates are good for each side. I believe the court selects the 13th because it's soonest. DDA Akemon wants to get on the record that the people have turned over to the defense, page numbers 29,104 to 29,458, pages of discovery. The court comments that it's several "War and Peace" novels. Lindner puts on the record that he's served the people and [I believe] the sheriff's with a copy of his 995 motion. Gargiulo then speaks up and wants to address the court. He wants to put a stop to the 995 motion filed by his attorney, Lindner. The court addresses Gargiulo. "Your attorney filed a 995 motion today. ... He's your attorney ... He has the right. ... If the Marsden hearing is successful, then it won't apply, because he filed it and not you." Gargiulo tells the court that Lindner has filed this motion without him knowing what's in it. He tells the court this will send him to death. Lindner then addresses the court. He [and his staff?] have attempted to see his client several times. The sheriff's have told them the last three times they've tried, that Gargiulo was not at the jail, that he was out of the facility to County General for medical treatment. I believe Lindner then tells the court that when they've tried to see him, they have gone to the jail at the correct time of day. "We don't know what he's being treated for." Lindner can't get the medical information released to them because of HIPA laws. Lindner wants to go on the record that the last three times they've tried to visit his client, they were told he's at County General for medical. After Judge Ohta goes off the record, the prosecution team, Detective Lillienfeld and Lindner chat in the well. And that's it. I head back to the train station and on my way home. This coming June 8, Gargiulo will have been in Los Angeles County Sheriff's custody for seven years. It's my understanding that Cameron Brown has been the longest in custody defendant in the county jail (11 years, 5.5 months) and Gargiulo, I believe, has been in custody the second longest. Gargiulo did have a different counsel when he was initially charged with attempted murder. I believe that attorney was hired by Gargiulo's family, but I'm not certain about that. It's my understanding that once the additional 187 felony murder counts were added, Lindner was assigned as counsel of record by the court. It's incredibly expensive to hire your own defense attorney when you are facing the death penalty. I'm sure there are cases, but I can't think of anyone who has done that. Lindner was probably saying you are someone's "Boswell." This means you are writing a biography of someone you are friends with and admire. I suspect Lindner thinks you are too pro-prosecution, sort of the "Boswell" for the prosecution. Just speculation on my part. James Boswell wrote one of the most famous biographies of all time on Doctor Samuel Johnson, the famous 18th Century philosopher. The two were good friends.